The 4-3-3 consists of a typical back line of 4 fullbacks, three central midfielders, and three strikers. This formation is designed to provide a lot of variety in the attack while gaining control of the central midfield. The 4-3-3 works well for teams who have a good defensive central midfielder who has a lot of responsibilities. He is skilled at disrupting the opponent’s attack, maintaining possession on the offensive side of the ball, offers support in front of the defensive fullback line, and supports the two other midfielders and attackers. He should be able to read plays well, have good awareness of passing options, and must be disciplined in maintaining shape, balance and depth to his team. A fullback on the back line has a responsibility to stay with his man wherever he goes. For example, when an offensive player makes a run out wide and receives a pass at his feet, the fullback should be arriving at about the same time so that the offensive player can’t turn towards the goal. If the opposing attacker comes inside, the fullback should stay with him. If he drops into the midfield area, again the fullback should stay with him. If at any point he goes too far beyond the midfield line, then the fullback is to let him go and recover his position on the back line. No matter where the ball is, for the most part, the fullback’s main responsibility is always the striker playing wide on the side. As for the midfielders, they also participate in defense. It’s typical that one of the three midfielders acts as a defensive midfielder while the other two participate more in the attack. The 4-3-3 works best when a team is on the attack and trying to win a match rather than contain the opposition and hold onto a lead. 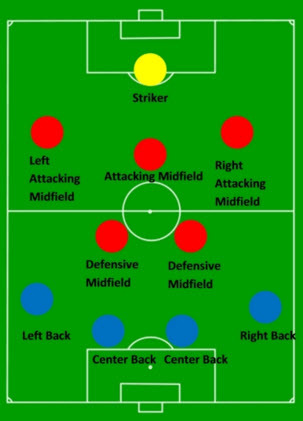 This formation relies on the center forward, capable of holding the ball when necessary so that his fellow wingers on either side have time to get into the play. These wide forwards are attacking players with good shooting ability that also use their speed to travel up the wing before cutting in towards the goal. At least two of the central midfielders offer support to these wing forwards. Those central midfielders take on triangle formation in the center part of the field and play the roles of attackers, defenders, and possession-maintainers. So, as you can see, both defensively and offensively, a well-balanced midfield is key to the 4-3-3. With a strong midfield, the fullbacks can also join the attack and use the large amount of open space that’s presented to them due to the high positioning of the wide forwards, who draw the defense back. The 4-3-3 might be one of the most overwhelming of all formations to the opposition. When in possession, it allows at least seven players to attack. One special quality of a good 4-3-3 is the strangling quality it brings. This comes from a three-man central midfield which uses passing triangles to dominate possession and three strikers who make runs high up the field. Opponents have difficulty getting the ball and keeping it once they do get it. Opposing defenders are faced with three attackers pressing them and attacking fullbacks close behind. The 4-3-3 has been likened to a tide against a sandcastle, meaning it might take a while, but the defense will eventually break! 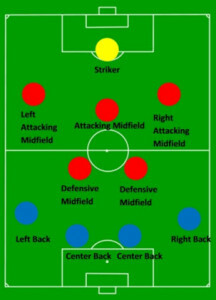 If you have a team that can’t keep hold of the ball very well while in the attack, the defense can become very vulnerable because on an offensive run the only players left back to defend are the center fullbacks and defensive midfielder. This can create a dangerous situation on a counter-attack as it gives the opposing team a lot of space to break into. One misplaced pass and the other team can quickly mount a dangerous counter attack. From the wide players, the 4-3-3 requires a huge amount of discipline. If the wide forwards do not track back then the potential to be exposed is huge. Also, fullbacks who make runs up the field to support the attack must have the energy to run back to their defensive line if necessary. They key to a successful 4-3-3 occurs during transition times. When the opponents regain possession then the defensive shape of the 4-3-3 team must occur quickly. When possession is regained by the 4-3-3 team, it must be prepared to create width, depth, and support going forward. Overall, this formation best suits a team that is looking to play an attacking style with wingers pushed high, overlapping fullbacks, and two offensive-minded midfielders.